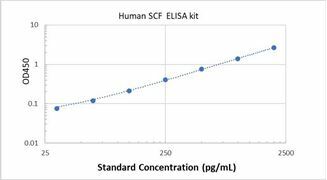 Specificity This assay has high sensitivity and excellent specificity for detection of Human SCF . No significant cross-reactivity or interference between Human SCF and analogues was observed. 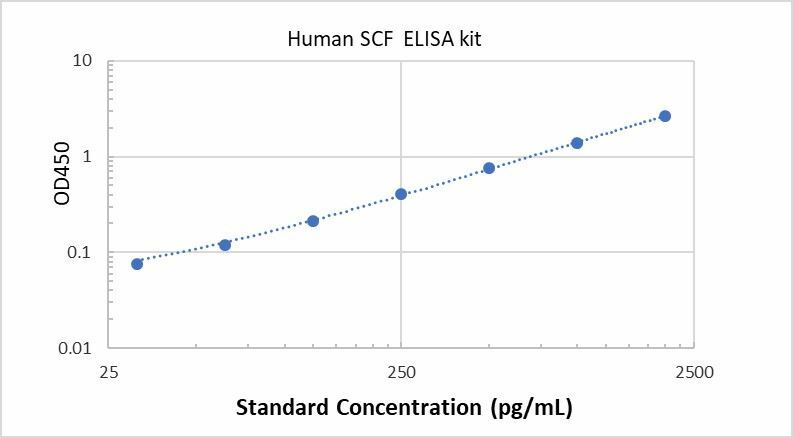 Typical Data ELISA: Human SCF ELISA Kit (Colorimetric). These standard curves are provided for demonstration only. A standard curve should be generated for each set of samples assayed. Background SCF plays an important role in the hematopoiesis during embryonic development. Sites where hematopoiesis takes place, such as the fetal liver and bone marrow, all express SCF. Mice that do not express SCF die in utero from severe anemia. Mice that do not express the receptor for SCF (c-KIT) also die from anemia. SCF may serve as guidance cues that direct hematopoietic stem cells (HSCs) to their stem cell niche (the microenvironment in which a stem cell resides), and it plays an important role in HSC maintenance. Non-lethal point mutants on the c-KIT receptor can cause anemia, decreased fertility, and decreased pigmentation.